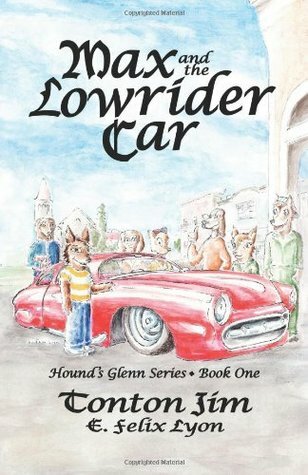 Author Tonton Jim appeared on the scene recently with a new series of books called Hound’s Glenn. The titular neighborhood is a place where families of dogs and wolves live and work — evidently, families of other species live in other neighborhoods — and the stories feature the daily adventures of a group of young canines growing up. Aimed at young readers and adults alike, each book features watercolor illustrations by the artist E. Felix Lyon. 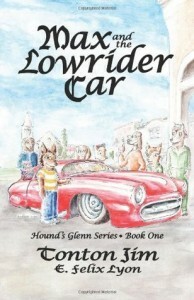 The first book, Max and the Lowrider Car, introduces us to Max. He’s a fifth-grader wolf cub with a simple-sounding assignment from school: Find something amazing in town to write about. He finds it in the local auto customizing shop, and soon Max and his friends (and family) are off on an adventure seeking old boring cars to bring back to shiny new life. The book is available on Amazon now, published by Dayton. The second book in the series, Harold and the Hot Rod, is coming soon. Hmm, are we sensing a theme here?